Say ‘Hello’ to St. Ives Naturally Clear Apricot Scrub (Blemish Fighting). 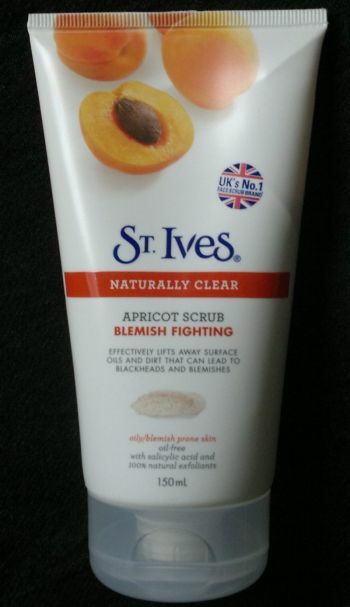 I haven’t used apricot scrubs since my early twenties, but when I spotted this scrub for half price at one of the two big drugstores, I thought, why not give St. Ives a try? In terms of exfoliating, this scrub is quite powerful. After the first use I felt that my skin was much softer. The scrub got rid of quite a few dead skin cells and dry patches. I’ll continue to use it every five to seven days. I can see that this St. Ives Scrub would work very well for people with oily skin and / or skin impurities too. If you’re looking for a powerful and reasonably priced facial exfoliator, you might want to try one of St. Ives’ offerings. St. Ives Naturally Clear Apricot Scrub (Blemish Fighting) is available as 150 ml for around £4, although right now it’s on special offer for £2.50 at Asda.